This is probably the first post that I have done on the same day as the subject. Thanks to my University I have the chance to stay in the student's residence of Jaca for a week during Easter. So yesterday I came here to Jaca by car with my friends Angela and Steven (a lovely couple who are getting married soon and i hope they will be very happy in their marriage). The problem is that at the same time I've got bad throat, fever, headache and pain in my nose!! Now, the main problem is the bad throat cause i can't control it even with the antibiotics that the doctor gave me before coming. So today, even if i wanted to join my friends to the natural park of Ordesa or go to some big mountains.. i had to stay in Jaca trying to get better. But the day's weather has been so great that i couldn't simply stay in my room so after breakfast (which is included) i went out to wander in the nearby countryside. 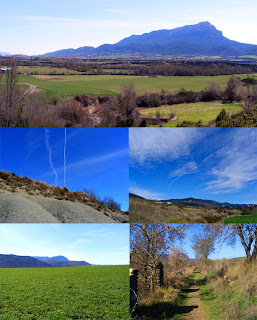 I took lots of pictures, relax along the river and walk over lots of hills. I have also made the script for my new 4 pages comic that i will present to a contest. 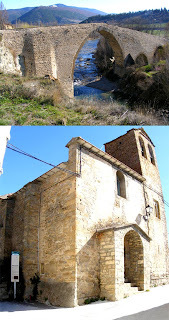 I started walking to the west, direction Guasillo, a nearby small village from which i wanted to climb a low hill. I made a short sketch of the route here using Google Earth (yeah, in the residence we have internet connection and i brought my laptop). In the picture above you can see a very old bridge close to Jaca (Pte San Miguel) which was build for the Santiago pillgrims (I think). The other monument is a church from the century XI in guasillo (there are several churches from that century around). So when i passed by that church i wanted to go on and reach the path to that hill i saw on Google Earth. But in my way there were like 7 dogs laying on the floor and when i stepped in, one of the dogs, the biggest, jump up and started barking... As you may know from previous posts, i have had problems with dogs before. This time i was very confident because i have borrowed a device to scare dogs through ultrasounds. So there i was pressing that button when suddenly ALL THE SATAN'S DOGS BECAME CRAZY because of the ultrasound and started chasing me FURIOUS!! I was shitting myself, they were more than 7 and they were very aggresive hunting dogs!! They were very angry with me, i kept pressing that button and it really annoyed them. I was out of their place and they kept following until i was again at the entry to the village. Meanwhile the owners said NOTHING. Im really pissed off with local people in the country side, id like to have something to kill their dogs, really. I didn't take pictures of that but as i couldnt go to the hill i had to wander and in the next village i found the same story, in a lighter version, so i took my camera out. As you see in the picture, the typical scene.. dogs waiting in the middle of your path and when u get closer... they come to you barking (sometimes i think their bark is "WHAAAAAAATT!!!"). These ones were not so scary so i just took the pictures as a way to explain (by the way, along the road there was a huge snake!! i got scared when it slipped away to the field. After that i tried to avoid any other village and limit myself to walk on the hills even when there was no path to walk. I preffered not having a path than bumping into more dogs again. It was a nice and relaxing stroll and the weather was great to take pictures. The above are some close shots of things that i have found out there today. I think some of them are interesting. Now im at my room again, complaining about my bad throat!! Let's see what will come tomorrow!! 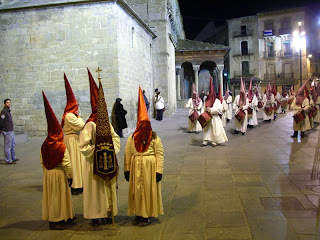 Then we watched the drumers of the Semana Santa (Easter) festivity. They were quite scaring.. i think if i was a child i would have started crying or something! 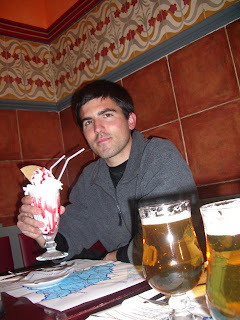 Ok i'll be good... you ... look... nice in that picture with that strawberry milkshake... grrr you should of got a chocolate one u CONO!